So I’ve been clearing out my filing cabinet, which I’ve barely even opened in the four years we’ve been living in Woking. This means I’ve been reminded of a bunch of papers and references I compiled for campaigning — mainly against ID cards. Now I don’t need all of these in hardcopy, so I’m looking them all up electronically. As I wanted to have them as reference, I figure that other people might also like the references, so why not put together a blogpost at the same time. CCTV in Glasgow: Main Findings, Scottish Office Central Research Unit, 7 July 1999 — The Scottish Office’s findings on their trials of CCTV in Glasgow, showing CCTV has no effect on local crime levels. A report on the state of the National Identity Register, May 2016 — Charlie Stross, writing in 2006 on the fiasco the National Identity Card scheme might have become by a decade later. Innocent in London – ‘Suspicious behaviour on the tube’ — David Mery was arrested in 2005 as a result of the Metropolitan Police’s incompetence and over-wide terrorism laws. Then had to wait over four years for an apology. Identity cards in Britain: past experience and policy implications — Jon Agar writing in 2005 to examine the two experiences of identity cards in wartime Britain and identify features relevant to the 21st century debate. BigBrother.gov.uk: State surveillance in the age of information and rights (PDF) — Yaman Akdeniz, Nick Taylor and Clive Walker writing in the Criminal Law Review, 2001, about the Regulation of Investigatory Powers Act. No hiding place — Bryan Appleyard writing in the Sunday Times in 2001: “Britain is now a surveillance state”. Via Cryptome, as the Sunday Times version is now paywalled. How did Ameenah Franks defeat the post-9/11 security apparatus? — From the Washington City Paper, February 2008, social engineering in a post-9/11 world. Letter to The Guardian, 23 September 2003 — David Aaronovitch wrote a particularly stupid piece, “Why I can’t wait for my identity card”, in The Guardian in September 2003, welcoming the National Identity Scheme. So I co-ordinated a joint letter rebutting it. As you can see from the affiliations listed against us each, this was before we had come together to create NO2ID as a unified organisation. An abridged version appeared in The Guardian on 25 September. The Future of National Registration, RG28/300 from the National Archives — Jon Agar provided Chris Lightfoot with a photocopy of this Crown Copyright document, thought to be from 1950. Silent Listeners: The Evolution of Privacy and Disclosure on Facebook (PDF) — Fred Stutzman, Ralph Goss and Alessandro Acquisti, all from Carnegie Mellon University, writing in the Journal of Privacy and Confidentiality (2012) 4(2):7–41 on “the world’s first multiyear, longitudinal privacy study” of Facebook. How to pass on your passwords — Maija Palmer writing in the FT in April 2010 on a new problem: how to bequeath one’s digital legacy. Tech Tools for Activism — a gateway to a set of tools to help campaign and organise more securely online. Online “Predators” and Their Victims: Myths, Realities, and Implications for Prevention and Treatment (PDF) — Janis Wolak et al (Feb–Mar 2008), American Psychologist 63(2):111–128. doi: 10.1037/0003-066X.63.2.111. A study in how to address the issue of “online ‘predators’ who prey on naive children using trickery and violence”. The Gowers Review of Intellectual Property, November 2006 — an independent review of UK intellectual property law (and copyright law in particular). Macaulay’s speeches on copyright — Thomas Babington Macaulay was a Whig politician and essayist. On 5 February 1841 he delivered a speech to the Commons that secured the defeat of Talfourd‘s attempt to extend the term of copyright to “life plus 60” (Wikisource). On 6 April 1842 he delivered a second speech to a Commons committee, opposing Viscount Mahón‘s attempt to extend the term to “life plus 25” (Wikisource); Macaulay’s proposal was largely passed as the Literary Copyright Act 1842. Representation in the Blogosphere: MPs and Their New Constituents — the full text of this was evidently available at some point, but the OUP have locked it away behind a paywall since. This paper, by Nigel Jackson was published in 2008 in Parliamentary Affairs 61(4):642–660; doi: 10.1093/pa/gsn021. (ST)^3 — a short story by Adrian Norman speculating (in 2004) on the pointlessness of ID cards by the time of the 2012 London Olympics. Your Face is not a Bar Code: Arguments against Automatic Face Recognition in Public Places — Philip E Agre of the Department of Information Studies at UCLA writing on the flaws in facial recognition technology. The piece was first written in 2001, the link here is to a 10 September 2003 version, but the printed copy I had was dated 30 November 2002. Combining Multiple Biometrics — John Daugman writing on how combining multiple biometrics does not improve (but actually worsens) the accuracy of the lookup. John Lettuce of The Register wrote about this with some added context at Read two biometrics, get worse results — how it works. Edit: Entitlement Cards and Identity Fraud: A Consultation Paper (annotated) (PDF) — This is my own copy of David Blunkett’s original ID Cards consultation, with my annotations on. This is what I used to write the big Stand.org.uk ID card report that we submitted as evidence to the consultation. I will disclaim now that the annotations were my initial thoughts — in some cases quite naïve ones — that were honed and clarified with the assistance of several other people. The information in the final report is doubtless of far more utility (and has the advantage of not needing to understand my handwriting or shorthand! ), but I figure the initial annotations might be of some interest. Also, I had a folder of stuff specific to the 2002 “Snoopers’ Charter” stuff relating to the draft “The Regulation of Investigatory Powers (Communications Data: Additional Public Authorities) Order 2002” to implement parts of the Regulation of Investigatory Powers Act 2000 , which we defeated. Descriptions and summaries of posts to the UK Crypto mailing list are my own analysis added now, not at the time. Post Office to Steam Open Your History File — Stand.org.uk, via the Wayback Machine, from 10 June 2002. A UK Crypto post by Owen Lewis, dated 11 June 2002 at 14:06 — listing all the bodies that were to be given surveillance powers, with a call to arms. Another UK Crypto post by Quentin Campbell, dated 11 June 2002 at 17:08 — expanding upon the logic behind Owen Lewis’s call to arms. A brief UK Crypto post by Ken Brown, dated 11 June 2002 at 16:21 — with examples of why “nothing to hide, nothing to fear” is a stupid argument. A UK Crypto post by Brian Gladman, dated 11 June at 17:53 — replying to Quentin’s 17:08 post. Dr Gladman was, for many years, a senior consultant and manager within the MoD and Nato. Stand.org.uk’s notes on the RIP Bill, which I printed 12 June 2002. I also had the full text of the The Regulation of Investigatory Powers (Communications Data: Additional Public Authorities) Order 2002 itself, but it would appear that HMSO becoming OPSI means they broke not only their own website, but also the Wayback Machine. I might scan this later (and bugger the Crown Copyright, obviously). Edit: The Regulation of Investigatory Powers (Communications Data: Additional Public Authorities) Order 2002 (PDF) — re-scanned from my own copy. This is presumably Crown Copyright and is reproduced here without permission for historical interest; I believe this to be fair dealing. Access to Communications Data: Respecting Privacy and Protecting the Public from Crime — Stand.org.uk’s response to the government’s subsequent [successful] attempt to pass the Snooper’s Charter in 2003. 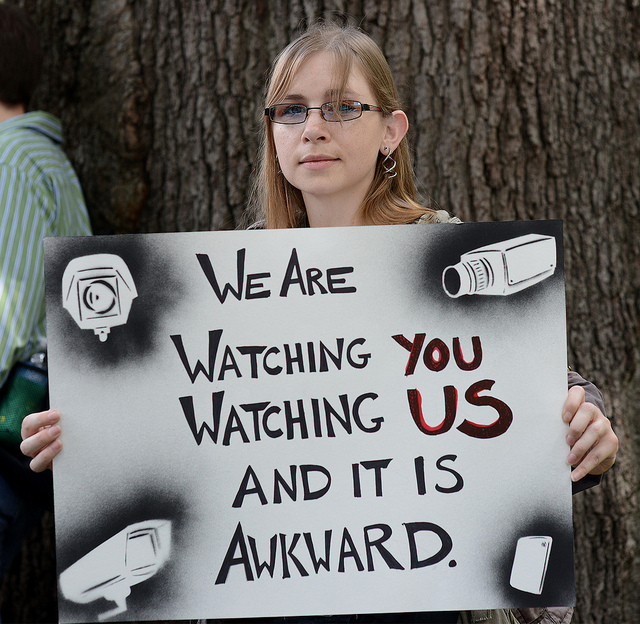 The photo Restore The Fourth Amendment 25 was taken by Stephen Melkisethian and was released under a Creative Commons BY-NC-ND licence on Flickr.